The Jewish story of Yazoo City was one of acceptance and assimilation, and in several cases, intermarriage and conversion. While Jews never formed a congregation in Yazoo City, they maintained a Jewish community in this southern Delta town for well over 100 years. According to local lore, the first Jew in Yazoo City was Louis Rosenberg, a self-proclaimed rabbi who arrived sometime before 1850 from Posen, Poland. Despite his possible background as a Jewish spiritual leader, he quickly assimilated, marrying a non-Jew named Sarah Sayers and fathering four children. Rosenberg became an innkeeper in Mechanicsburg, Mississippi. His children married non-Jews and abandoned any semblance of Jewish practice. According to naturalization records, several other Jewish immigrants trickled into Yazoo City around this time. Samuel Friedlander was naturalized on May 3, 1843; in that same year, citizenship was sought by three other Jewish immigrants. In 1854, they were followed by Jacob and Louis King, and in 1860, Abraham Rosenthal. Solomon S. Zelnicker saw active duty in the Confederate Army during the Civil War. He landed in America in 1855, settled in Yazoo City and married a woman named Louise Newton. After the war, he moved to New Orleans. During the Civil War, Union soldiers temporarily occupied Yazoo City and raided it for provisions on six occastions. By the end of the war, much of the town was destroyed, and Yazoo City citizens spent the next ten years rebuilding. In 1878 there were several businesses run by members of the Jewish community, including a hardware store called Harris and Nierman, and the Independent Lock and Ladder Company, run by David Wolerstein. The Wise Brothers’ Store was founded in 1875 by Herman Wise, and existed as a fixture of Yazoo City up until 1969 when it was sold by their descendants. Louis and Herman Wise had married their cousins, Julia and Eugenia, and arrived in Yazoo City around 1870. After building the largest dry goods store in the city, they began investing in local cotton plantations. New waves of Jewish immigration maintained the Jewish community of Yazoo City. In 1878, there were approximately 44 Jews in Yazoo City. In 1882, there was a huge flood of the Mississippi river, and seeing a business opportunity in the rebuilding economy, there was an influx of Jews. In 1904, a great fire destroyed much of Yazoo City. According to local legend, the fire was started by the “Witch of Yazoo,” who supposedly broke the chains around her grave and burned down the town. The fire actually started in the Wise home on the day their daughter Pauline was to be married. It destroyed the entire business district and more than one-hundred residences on adjacent streets. The American Israelite reported that every Jewish family lost their businesses and homes. Jewish merchants like William Hirsch were quick to rebuild. Indeed, The Yazoo Centennial characterized him as a Yazoo City businessmen, “upon whom discouragement and disaster seem to act merely as incentive to greater effort, and he is to-day conducting a larger business in a finer store than was the case before the fire.” The store was started by William's father, Myer, who left Germany with his wife Rose in 1884, leaving their young son William with his grandmother. She later brought 5-year-old William to America and Yazoo City. Like Hirsch, other town residents quickly rebuilt new brick buildings. The Yazoo City economy quickly recovered. In fact, from 1909 to 1919, a city-owned street car system operated on the principal streets, the first of its kind in the nation. Yazoo City Jewish settlers made economic and civic contributions that warranted respect and admiration from their neighbors. Jewish merchants like Louis Price moved in the late 1930s to open the Black and White Store. 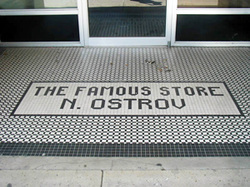 Other new additions to the Jewish community included N. Ostrov, who opened the Famous Store and M. Davidow, who opened a general store. Henry Clay Lewis was born June 26, 1825, in Charleston, South Carolina as the seventh child of David and Rachel Salomon Lewis, French and Italian Jews. Eventually, he came to Yazoo City to stay with brother, Joseph, and attend school. His brother went bankrupt in 1837, and to support himself financially, Henry began working in the cotton fields. When he turned 16, he apprenticed with a local doctor named Washington Dorey. He moved to Louisville, Kentucky to enter Louisville Medical College in 1844. Following his graduation, he moved to Louisiana to practice medicine in Madison Parish on the Tensas River. He eventually produced popular literary sketches based on his life in the Louisiana frontier. The sketches followed a young swamp doctor named Madison Tensas, and several were published under the pseudonym "Madison Tensas" in New York's Spirit of the Times. Three years later, Lewis moved to Richmond, Louisiana, where he expanded his practice and wrote his only book, Odd Leaves from the Life of a Louisiana Swamp Doctor. Lewis drowned at twenty-five, while crossing a flooded river in order to tend to cholera patients. On August 29, 1875, the Jewish community of Yazoo City elected to form a congregation called “Benai Israel.” The 30 member congregation designated Emil Schaefer as President and Louis Wise as Secretary. Members Reinhold and Fisk offered themselves to read the different prayers. A correspondent for the the American Israelite described the fledgling community as holding the “esteem and respect in the hearts and minds of the Gentile community.” In fact, congregation president Emil Schaefer served as an alderman, a member of the Board of School Trustees, President of the German Benevolent Association, Master of the Masonic Lodge and Secretary of the Board of Trade. According to the author reporting from Yazoo City at the time, the only thing the Jewish community lacked was an “increase in the daughters of Israel,” since the community reportedly only had 5-6 Jewish women. Unfortunately, the established congregation would not have enough resources to last in the long-term. As the Jewish population grew it became easier and more attractive to hold onto Jewish traditions. By 1937, the Jewish population rose to 61 people. In 1941 the Yazoo City Herald announced that, “Many of the Yazoo members of the Jewish faith will be out of the city Wednesday that they may have the privilege of worshiping in the synagogues of Jackson, Greenwood, and other cities. Their places of business will be closed between sundown Tuesday and sundown Wednesday.” Though the article does not mention how many stores were closed, the presence of the article shows that Jews represented a prominent position in the commercial livelihood of Yazoo City. It also shows that Yazoo City Jews observed the high holidays even though they did not have a synagogue or congregation of their own. Jews enjoyed ecumenical relationships with their neighbors from early on in the town’s history. The American Israelite reported that in March of 1895, a Baptist preacher by the name of Rev. A. J. Miller, preached a special sermon to the Jewish community on the subject of Abraham. He extended an invitation to each Jewish family in the city and received high praise from the large audience in attendance for being a “brilliant orator in every sense of the word,” as well as “a friend of the Israelites.” When longtime resident Meyer Hirsch died in 1904, the funeral service was conducted by Rev. Albert Martin, the local Episcopal minister, and longtime friend of the family. The most intriguing evidence of interfaith cooperation can be seen in the formation of a Christian Committee for the United Jewish Appeal in 1947 under the leadership of J.F. Barbour, the father of Mississippi Governor Haley Barbour. The fund sought to raise money to help Holocaust survivors still living in Displaced Person Camps in Europe. An article in the local newspaper stated that Jews were the group to suffer most dearly from the ravages of war, and “are still carrying the heaviest post-war burdens.” The article urged the citizens of Yazoo City to donate money to reach a goal of $6,500. In order to urge contributions from the Yazoo City citizens the article begs, “In the past our Jewish friends and neighbors have always contributed generously when called upon for humanitarian causes. It is only right that the Christian faith should answer the call of the distressed across the waters and give our means that they may again take their rightful place among the people of the world.” This effort was a remarkable example of the amicable community relationships between Jews and Gentiles in Yazoo City. Jews living in the Bible Belt had to contend with an overtly Protestant culture. It was not uncommon for Jews to support their Christian friends when they celebrated holidays. In the early 1950s a young Jewish girl by the name of Gracie Myron won the local school’s Christmas door decorating contest. Yazoo City Jews served in the military throughout history. In addition to Solomon S. Zelnicker's service during the Civil War, Frank Rakowski served as a volunteer in the Spanish-American War. During World War II, the local paper ran an article featuring Jewish service in the armed forces. This could have been due to the European stories of the Holocaust that had trickled into Yazoo City or the prominence of Jews within their own town. The article asserts that over half a million Jewish men served in all branches of the military, and nearly 26,000 had earned citations for valor and merit. This article challenged the anti-Semitic stereotype that Jews weren’t courageous or patriotic enough to fight for their country. Regardless of the reason for publishing the article, it displays Jews in a very positive light, and suggests that positive relationships existed between Yazoo City Jews and their neighbors. Jewish life in Yazoo City seems to have peaked in the 1940s, and by the 1950s the Jewish community had begun to decline. Yazoo City Jews gradually moved to larger cities with bigger Jewish populations such as Memphis and Jackson. Often their financial stability depended on railroad commerce, and as the value of this trade dwindled, Jewish residents of Yazoo City gradually moved away in search of better opportunities. Though their numbers declined, the remaining Yazoo City members stayed active and visible, with Jewish citizen Harry Applebaum serving as mayor from 1954 to 1960. Though Yazoo City Jews never had a congregation or a synagogue, they still made very important civic contributions to their community. Their presence was large enough to command attention within the community, and their contributions warranted respect and admiration from their neighbors. They were essential in keeping the town afloat after the disasters of the flood and fire, and they were well liked by their neighbors. Sometimes this resulted in total assimilation and conversion, causing Jews to lose touch with their religious roots altogether. Other times, however, it forced the Yazoo City Jewish community to work harder for their faith, and travel long distances for religious worship and education. Though there is no longer any active Jewish community in Yazoo City, their contributions to the state and the Southern Jewish experience are remembered with pride and affection. DeCell, Harriet and JoAnne Prichard. Yazoo, its Legends and Legacies. Yazoo Delta Press: Yazoo City, Mississippi, 1976. “Died.” The American Israelite. March 3, 1904. Yazoo City Mississippi File. Institute of Southern Jewish Life Archives. “Editorial.” The American Israelite. June 3, 1904. Yazoo City Mississippi File. Institute of Southern Jewish Life Archives. Evans, Eli. The Provincials: A Personal History of Jews in the South. New York: Free Press Paperbacks, 1973. “Hotty Toddy Hometown: Yazoo City, Mississippi.” Accessed February 19, 2015. “J.F. Barbour is Chairman of Drive for Jewish Relief.” Yazoo City Herald. June 19, 1947. Yazoo City Mississippi File. Institute of Southern Jewish Life Archives. McLaughlin, Lacey, “Race and Change in Haley Barbour’s Hometown. The Jackson Free Press. March 2, 2011. Accessed February 19, 2015. http://www.jacksonfreepress.com/news/2011/mar/02/integrating-yazoo-race-and-change-in-haley/. “Over Half a Million Jewish People in the Armed Forces.” The Yazoo City Herald. Nov. 7, 1946, 1. Yazoo City Mississippi File. Institute of Southern Jewish Life Archives. History Intern for June 2003. Yazoo City Mississippi File. Institute of Southern Jewish Life Archives. “Henry Clay Lewis, 1825-1850 and Felix Octavius Carr Darley, 1822-1888.” Accessed February 19, 2015. http://docsouth.unc.edu/southlit/lewis/summary.html. Tuchman, Miriam. "Bertha Schaefer." Jewish Women: A Comprehensive Historical Encyclopedia. 1 March 2009. Jewish Women's Archive. Accessed February 19, 2015.http://jwa.org/encyclopedia/article/schaefer-bertha. “W. Hirsch.” The Yazoo Sentinel: Illustrated Magazine Edition. May 25, 1905. Yazoo City Mississippi File. Institute of Southern Jewish Life Archives. “Wise Bros.” The Yazoo Sentinel: Illustrated Magazine Edition. May 25, 1905. Yazoo City Mississippi File. Institute of Southern Jewish Life Archives. “Yazoo City.” The American Israelite. Aug. 30, 1875. Yazoo City Mississippi File. Institute of Southern Jewish Life Archives. “Yazoo City, Miss.” The American Israelite. March 28, 1895. Yazoo City Mississippi File. Institute of Southern Jewish Life Archives.